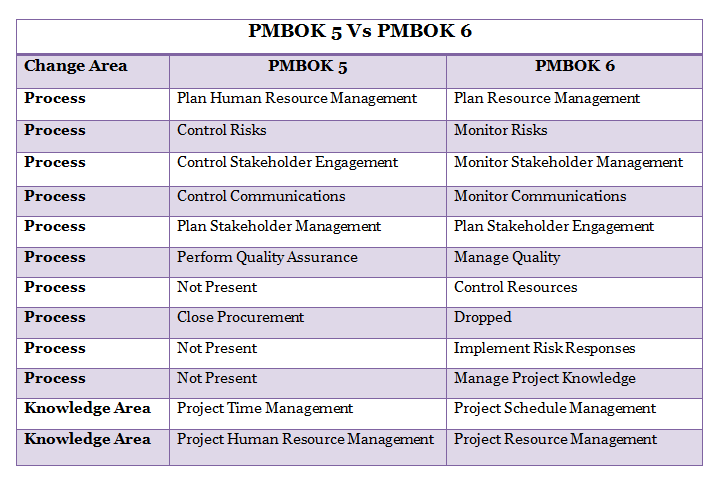 What is the difference between PMBOK5 and PMBOK6? In PMBOK 6th Edition, the total number of processes has been increased to 49 from 47 with the addition of three new processes and deletion of one process. Also, the name of some processes has been changed that is mentioned in this table. Also, the section 6.4 of PMBOK 5 named Estimate Activity Resources has been moved to the section Project Resource Management. The Chapter 2nd Organizational influences and Project Life Cycle and Chapter 3rd Project Management Processof the PMBOK 5 has been merged to the Chapter 2nd The Environment in Which Project Operates of the PMBOK 6. PMP Talent Triangle consists of Strategic and Business Management, Leadership, and Technical Project Management. Key concepts – This new section has been added to make PMBOK interesting to read. This section will explain the summary of the chapter, this will make the chapter easy to understand. Tailoring considerations – This section tailors the processes to meet the requirements of the project, stakeholders, and organizations. In this section, those areas are covered that a project manager should consider during the tailoring of processes. Trends and Emerging Practices – This section of the chapter consists of the emerging practices and trends that are not required to be practiced now during the project executions. Considerations for Agile/Adaptive Environments – This section introduces some agile techniques and tools such as iteration planning and sprint. The areas that follow a different approach in the agile environment are covered in this section. Appendix X3, X4, X5 and X6 of the PMBOK 6 covers of Agile Environment, Key Concepts, Tailoring Considerations, and Tools & Techniques respectively. Reading these appendixes will help the candidates to understand the concepts and themes of PMBOK 6. What will I get on purchase of PMP Certification from Whizlabs? What are the recommendations to prepare for PMP Certification? What are the different disciplines in which Whizlabs provides training?